Tata Sky offers Sony Ten 2, Sony Ten 3 free channels for new customers for FIFA WC 2018. Direct to home (DTH) operator has launched an offer for new customers for the 2018 FIFA World Cup. As part of the acquisition strategy, the DTH The operator will offer Sony Ten 2 and Sony Ten 3 free to all new acquisitions from May 15 to July 15. All new acquisitions in standard definition (SD) decoders (SD) can receive Sony Ten 2 and Sony Ten 3 free between June 12 and July 15. In addition, all new high definition (HD) acquisitions will be eligible to obtain free Sony Ten 2 HD and Sony Ten 3 HD between June 12 and July 15. In March, the DTH operator launched an offer for the IPL through which all new acquisitions were provided free of charge from Star Sports 1 and Star Sports 1 Hindi free of charge from March 9 through May 27. 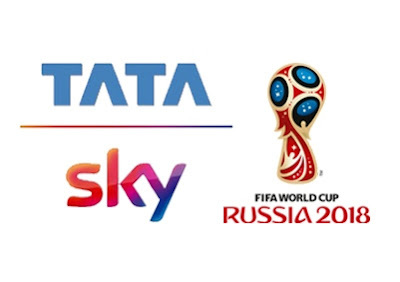 Tata Sky had recently launched a campaign asking cable television customers in South India to switch to the DTH platform to enjoy a better television viewing experience. The campaign directed to Tamil Nadu, Andhra Pradesh, Telangana and Karnataka present the actor Nayanthara. The Maximum Entertainment campaign highlights the importance of moving from analog cable to digital entertainment. The DTH platform also launched an advertising campaign with Amitabh Bachchan to attract customers in Odisha, West Bengal and the Tier II and III markets of Maharashtra. In the advertising campaign '#HarSceneKaMazaaLo', Bachchan adorns the role of a 'Bengali Critic' giving his point of view on iconic film dialogues and superstars in a series of 9 advertising films. The objective of the advertising campaign is to show how an individual enjoys Tata Sky's offers to the fullest, highlighting the abundance of entertainment on all platforms. Tata Sky's net earnings for FY18 had soared to Rs 408 crore for the fiscal year ending March 2018 compared to Rs 8 crore in the previous fiscal year. The PAT margin saw an improvement of 7.1% compared to 0.1% in the prior year period. In the fiscal year 2017, the company's net profit had plummeted by 90% to Rs 8 crore compared to Rs 80 crore in FY16. The income of Tata Sky for the fiscal year has increased by 8% to Rs 5719 crore from Rs 5302 crore in FY17. Revenue was Rs 4472 crore in FY16.